For mission dates, targets and mission reports see Combat Missions. Capt John A. 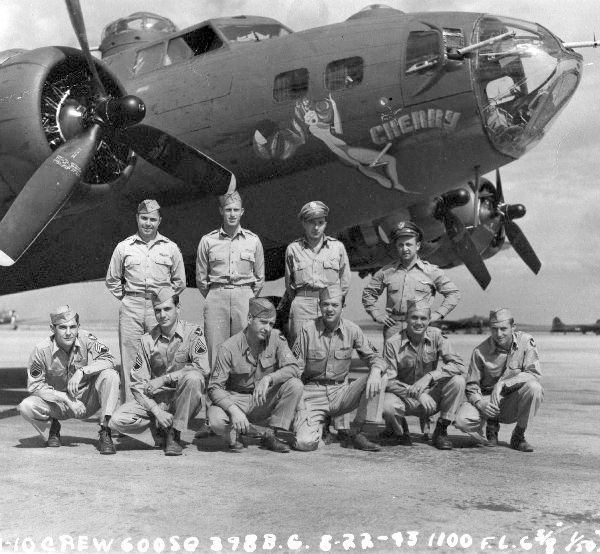 Long (P)(KIA) - 27 credited missions flown - All as First Pilot Seven missions flown with Group (LC) or Squadron (SCL) Lead Crews - 128 (LC), 132 (SLC), 135 (LC), 140 (SLC), 141 (SLC), 146 (SLC) and 151 (SLC) KIA on 11 May 1944 (Mission 151). 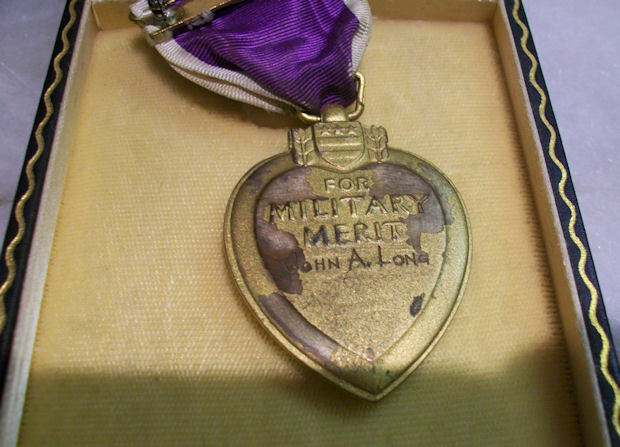 Awarded the Silver Star Medal (Posthumously) on mission 151 for keeping his blazing fortress in formation long enough to drop its bombs in the Squadron pattern before going down out of control. Is buried in the Ardennes American Cemetery near Liege, Belgium. 1Lt Amon E. "Butch" Earhart (CP) - 28 credited combat missions flown: 14 credited missions with Capt Long (82, 83, 86, 88, 89, 92, 93, 94, 95, 97, 100, 101, 102, 103, 107) - Substitute Co Pilots used on other Capt Long missions; 4 credited missions with other Pilots (110, 125, 126, 127); 2 credited missions as a Lead Crew Tail Gunner/Observer (120, 124. Upgraded from CoPilot to Pilot on orders dated 25 October 1943. Flew on 9 dispatched (7 credited) missions as a First Pilot - (136 (Non-Credited spare B-17 not used), 136, 137A (Non-credited Air Sea Rescue mission), 139, 140, 141, 146, 150, 151. Completed combat tour on 11 May 1944 (Mission 151). 1Lt George M. Carroll (N) - 31 credited combat missions flown: 14 missions with Capt Long (82, 83, 86, 88, 89, 92, 93, 94, 95, 97, 100, 101, 102, 103, 107) - Substitute Navigators used on other Capt Long missions; 15 credited missions as a Lead Crew Navigator (110, 125, 132, 133, 134, 137A (Non credited Air Sea Rescue mission), 138, 177, 186, 194, 201, 207, 211, 215). Completed combat tour on 31 July 1944 (Mission 215). 1Lt Guiseppe Cascio (B) - 26 credited missions flown: 13 with Capt Long (82, 83, 86, 92, 93, 94, 95, 100, 101, 102, 103, 107) - Substitute Bombardiers used on other Capt Long missions; 13 with other Pilots (88, 97, 150, 161, 163, 165, 166, 170 (Lead crew), 174 (Lead Crew), 178, 182, 183, 184). Last mission on 19 June 1944 (Mission 184). T/Sgt Ralph T. Jennings (R) - 28 credited missions flown: 26 with Capt Long (All of Capt Long missions except mission 151); 3 dispatched (2 credited) missions with other Pilots ( 122, 137A - Not-credited Air Sea Rescue mission and 231). Last mission on 24 August 1944 (Mission 231). T/Sgt Clarence G. Wilson (E)(KIA), S/Sgt Albert J. Ledley (LWG)(KIA), S/Sgt Mace Henson (RWG)(KIA), S/Sgt Anthony T. Orlando (TG)(POW) - 27 credited missions flown - All of Capt Long missions. S/Sgt Orlando (TG) flew on mission 135 as an Observer with a substitute crewman as Tail Gunner. All Missing in Action on 11 May 1944 (Mission 151). T/Sgt Wilson (E) is buried in the Lorraine American Cemetery near Moselle, France. S/Sgt Frank C. Logan (BTG)(KIA) - 23 credited missions flown: 19 with Capt Logan (82, 83, 100, 101, 102, 103, 107, 116, 118, 119, 123, 128, 129, 132, 135, 140, 141, 146, 151); 4 credited missions with other Pilots (136, 137A - non-credited Air Sea Rescue mission, 138, 139 - As LWG and 150 - As TG). KIA on 11 May 1944 (Mission 151). 2Lt Wilbur V. Gee (CP)(POW) - 3 credited missions flown: 2 with Capt Long (146, 151), 1 with 2Lt Donald M. Johnston (148). 1Lt Henry S. Przbyszewski (N)POW) - 30 credited missions flown: 4 with Capt Long140, 141, 146, 151); 26 with other Pilots - 24 with 1Lt Fred H. Wilson (89, 91, 92, 95, 96, 97, 98, 101, 102, 104, 106, 109, 113, 115, 116, 117, 119, 121, 123, 126, 127, 131, 136, 139), 1 with Capt Willard H. Bergeron (118), 1 with 1Lt John C. Lawlor, Jr. (120). 1Lt Joseph F. Fahlsbusch (B)(KIA) - 29 credited missions fkown: 5 with Capt Long (129, 140, 141, 146, 151); 24 with other Pilots - 22 with 1Lt Fred H. Wilson (89, 91, 92, 95, 96, 97, 98, 104, 106, 109, 113, 115, 116, 117, 119, 121, 123, 126, 127, 131, 136, 139), 2 with Capt Willard H. Bergeron (118, 122). T/Sgt Oscar Villasenor (R)(KIA) - 10 credited missions flown: 1 with Capt Long (151); 9 with other Pilots: 2Lt David F. Hicks (123, 124), 2Lt Joespeh E. Stevens (129, 132, 133), 1Lt Amon E. Earhart (139, 140, 141), 2Lt Donald M. Johnson (146). Capt Robert P. Livingston (Statistical Officer - 303rd BG(H) Hdqs)(POW)(WIA) - 2 credited missions flown as a mission observer: With Capt Long (151); with 1Lt Fred F. Wilson (131). He suffered a right broken ankle from shrapnel and was hospitalized when he became a POW. 11 May 1944 (Mission 151) to Saarbrucken, Germany in B-17G 42-97260 Bow-Ur-Neck Stevens (360BS) PU-Q. Aircraft named after Col Kermit D. Stevens, Commanding Officer 303rd BG(H). Absorbed a flak hit which set the No. 1 engine ablaze and knocked the B-17 out of the formation. Capt Long forced his aircraft back into the formation by straining the three remaining engines. Just after the bombs were released another flak burst tore the #3 engine and propeller off the B-17, throwing it completely out of control. It flipped over on its back and went down in a dive, pulled out of this dive and almost immediately pulled into another dive and crashed near Saarbrucken, Germany. 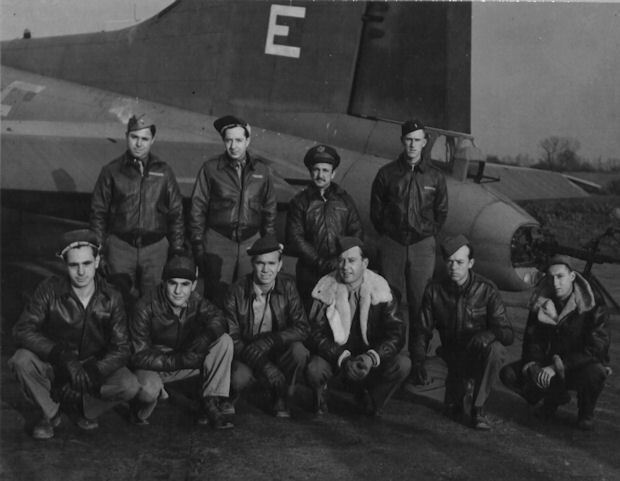 Four crewmen were able to parachute from the stricken B-17 and became POWs. The other seven crewmen were Killed in Action in the aircraft crash. (Missing Aircrew Report 4868).